Thank you so much for your help and patience with our rebate problem. It was unfortunate that such a simple thing involved so much time, but without your help I would still be trying to find a salutation. Thank you again for the great service on my system. This letter is an attempt on our part to show our thanks, appreciation and gratitude for all hard work and dedication of the employees and supervisor of your company. 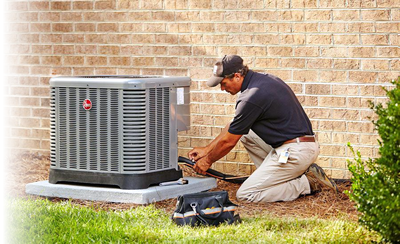 Their attitude insured that the system we ordered was installed correctly and in proper working order. The efforts of Mr. James Wood maintenance supervisor cannot be understated. His diligent skills, courteous manner, and never give up attitude were something to behold. He is truly an asset to your company. Last but not least we want to thank Mr. Chris Wagner sales manager for his understanding of the situation and making decisions to insure our total satisfaction. We have and will continue to recommend SouthernAire to our friends and neighbors. We want to thank you for the amazing amount of work you did to get our system up and running. Our home is so much more enjoyable now. Thanks a million for your prompt service on a weekend. Thank you for making an excellent presentation on the merits of the Carrier System, payment options, etc. You knew the product and inventory well and I appreciate that. The system works like a charm. I just love it. It is clean, efficient and easy to manage. Ken and Jim the insulation crew could not have been better. They were clean, fast, friendly and knew their jobs very well and worked together as a team in a very professional manner as they went about their work. I had a great deal of confidence in their workmanship. They were also very good about answering all my questions, showing me how to work the thermostat, pointing out all the updates and showing me how the system runs. They were so clean and neat I think they left my garage cleaner than it was when they arrived. They were nice to be around, I was very impressed. I’m also impressed with Tim who does the twice a year maintenance on my system. He was also clean, friendly and knows his business. All in all I am very pleased with SouthernAire. Also impressed with your well trained employees their good attitudes and work ethics. You run a first class organization. I will recommend SouthernAire to my friends.